RBS N.V. features on the list of designated banks for the Comprehensive Assessment (CA). See the ECB CA document here. Though the name suggests Scottish origins, RBS N.V. is incorporated in the Netherlands; thus subject to direct Dutch supervision (and indirectly subjected to UK supervision via the Bank of England, which supervises RBS Group, the mother holding company). It is the first time this bank will take part in such an assessment, as it did not take part in the 2010 and 2011 stress tests of EBA, see the EBA website. Having flown under the radar for some time, this bank may have not benefited from the disciplining force of the market or from relevant supervision structures. Or has it? I decided to take a look at the accounts, which can be found in a separate section of the RBS Group website. The report can be found here, that is, the mid-year report of 2012. It apparently shows strong ratios, i.e. a Core Tier 1 ratio of 17.1% (up form 11.7% just six months earlier); Tier 1 is 21.4% (up from 13.9%); and the Total capital ratio is 24.9% (up from 19.8%). This looks solid! 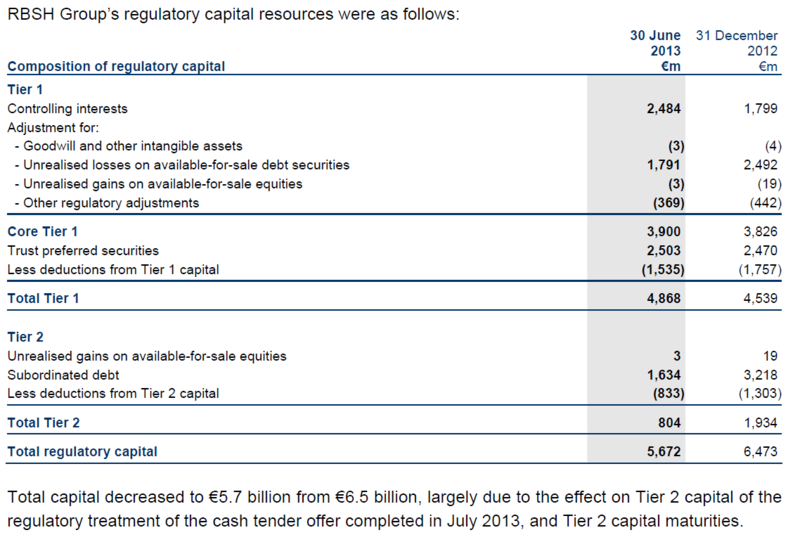 However, the composition of capital presents a much less solid solvency position, see the picture below. Under Basel III rules, this item won’t count as capital, see footnote 10 of the Basel III rules text. Moreover, it will likely not fully count as capital under the EBA 2014 stress test: this test relies on the capital definition that phases out non-capital items in line with Basel III transitioning. Moreover, the value of available-for-sale debt securities depends on interest rates. When interest rates go up, prices of fixed-rate bonds fall, which will aggravate the negative effect of Unrealised losses on available-for-sale debt securities on capital under Basel III. Elimination of the 1,791 for Unrealised losses on available-for-sale debt securities lowers the Core Tier 1 ratio to 9.3% (down from 17.%). 2) Trust preferred securities determine more than 50% of Tier 1. These securities are callable at any time and probably will not qualify as Tier 1 capital under Basel III rules, see my previous post on the eligibility of Tier 1 securities under Basel III. This too will affect RBS N.V.’s performance in the 2014 EBA stress test. Elimination of Trust preferred securities will decrease the Tier 1 ratio of RBS N.V. to 10.4% (down from 21.4%). Previous Post Jay: the ECB comprehensive assessment is out!